mymedicalimages.com’s and MetisMD’s partnership began with a cardboard box. Or, rather, the many cardboard boxes that constructed mymedicalimages.com's impressive booth display at the American Alliance of Orthopaedic Executives Annual Conference. Attendees and exhibitors alike were struck by the unique design (see the picture on the right). Dr. Gregory Goldstein, Founder and CEO of MetisMD and Jeffery Adler, Company Advisor at MetisMD were at a nearby booth having their headshot photos taken when they noticed the cardboard furniture and walked over to begin a conversation. 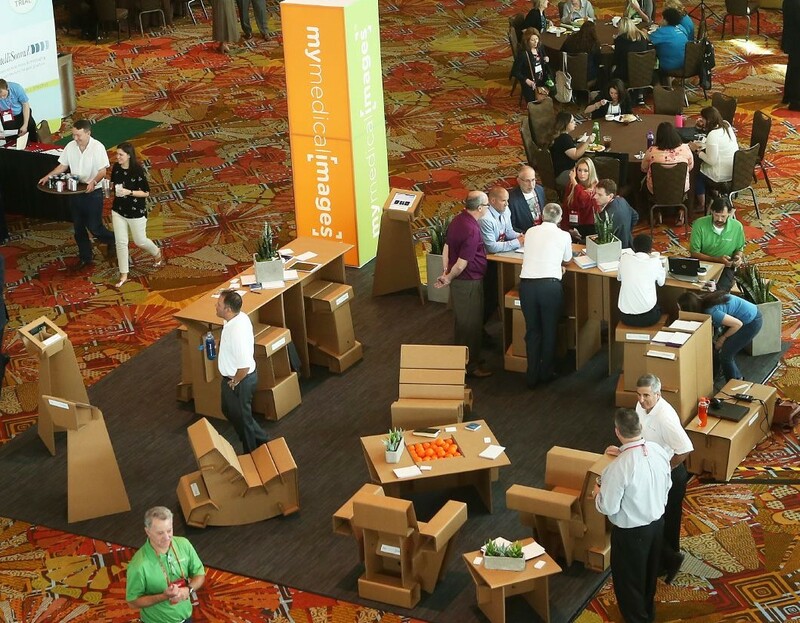 During their brief but impactful conversation at the Annual Conference, they quickly realized that their products complemented each other so perfectly, it was as if fate (in the form of a cardboard box display) had drawn them together. MetisMD provides teleradiology services and second opinion for patients and orthopedic facilities (see a picture on the left of the Giving Wall MetisMD sponsored at the 2018 Annual Conference to support the conference charity, Give Kids the World). MetisMD has also introduced Rad to the Bone, the first on-demand orthopedic radiology service. mymedicalimages.com is an easy, convenient, and HIPAA-compliant method for saving and sharing medical images on the Cloud. When Adler and Goldstein watched a demo of mymedicalimages.com, they saw the potential synergies that could exist between both companies. mymedicalimages.com had not yet launched when they exhibited at AAOE’s 2018 Annual Conference, but recognized the opportunity for feedback from administrators and C-level leaders. “We were really just testing the waters to see how attendees would respond to our product,” Monteith explains. This decision proved successful not only in gaining critical user feedback but also in connecting with MetisMD, something they couldn’t have anticipated. This year the two companies will return to the event where it all began, AAOE’s Annual Conference, taking place May 5-8, 2019 in Nashville, TN. They will exhibit at a combined booth, which is sure to be a show-stopper after last year’s unique display! Come see them in Nashville by registering for the Annual Conference today! Interested in exhibiting at the conference? Learn more today!